WGN America’s “Prime Crime” lineup is welcoming PERSON OF INTEREST to the mix on Tuesday, September 1st. The move could be a big one for PERSON OF INTEREST — with the series not airing until midseason, this gives new fans the chance to catch up before the shortened fifth season launches on CBS. PERSON OF INTEREST is hitting an important milestone with its WGN America syndication launch and Netflix debut. What do you hope this means for the show? 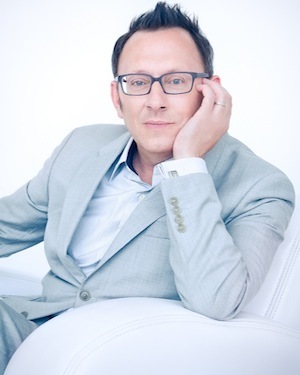 Michael Emerson: I’m not terrible well-educated in how the industry works, but I think it’s good and it potentially brings [the show] to a newer and larger audience. I hope so. I feel like PERSON OF INTEREST has a loyal following among the people who watch CBS regularly. Which, as you know, is an older crowd. I do have a nagging feeling that young people who might watch and enjoy the show just aren’t getting to it because of where it is and what time it is and all of that. It could be really cool if a lot of new people start streaming it and watching the episodes at once; that would be cool. As part of WGN America’s promotional campaign, they had you film promo spots with ELEMENTARY stars Jonny Lee Miller and Lucy Liu. What was that experience like? ME: They’re cute, aren’t they? Jonny and Lucy are really lovely, fun people. I can’t believe I’ve been shooting in the same studio as them for four years and don’t see more of them. So it was nice to spend a little time with them. But I have to tell you, that was one of the roughest shoots, ever. It was freezing cold, we were on a windy rooftop in Brooklyn. There were dangers galore: steep and crumbling stairs; electrical cables; wind blowing scenery around. We were all happy to escape with our lives! They wound up making some cute spots out of it [though]. Do you think you’ll check out any of the syndicated run? ME: I’m probably not home to catch it often, but I will try and dip in and refresh my memory of episodes past. I shot over 90 of them now. People say, “What was your favorite?” or “Who was your favorite guest star?” And I can’t remember any of those things. It’s one gigantic episode in my mind. It’ll be fun to go back and check in on some of them. If someone hasn’t seen the show, what do you want to tell new viewers about those earlier seasons? ME: I remember the show — and the whole tone of everything — being quite serious and dark. I think the show has gotten more balanced over the years. It has more fun in it, despite the fact that it’s about inherently grave and dangerous events. I think sometimes now I may be in a comedy and I’m the only one who knows it. Sometimes I feel like that. A good number of the show’s big questions and issues were rooted in the series’ pilot. When you first read that script, what questions did you have about where the show would ultimately go? ME: I guess I didn’t ask many questions. I read it and I knew what my business was. I knew I was going to have to establish quickly a disability. I had to give that some careful though in case…the show went five seasons [and] I would be doing a lot of that. It had to be something that wouldn’t be putting me in physical therapy…but I didn’t have many character questions. The intention of the work seemed clear to me, and I knew from experience if we went on to more episodes, everything would get clearer and we would just cross bridges as we came to them, so to speak. The team dynamic has also changed throughout the years, as people have left the show and others have joined on. How has that changed the feel of things for you? ME: I think in this fifth season, we’re going to regain more characters than we lost. I think we’re going to see more of Shaw…if it’s indeed our last season, we can expect to see lots of last season kinds of events. We may lose people. God knows who we’ll lose. If you’re reaching the end of things, who can you not afford to kill? You can kill whoever you want, if it works, if it’s dramatic. And that was a mentality was set up from the first episode: that both of these men probably wouldn’t make it out alive. ME: Right. I think the show still kind of lives and breaths by that principle: we are on a suicide mission, and we can’t live like other people, because we know something other people don’t ever need to know. Since the show films on location in New York, what kind of reactions have you gotten over the years to the show? ME: People like it. People of all ages. I’m sometimes surprised, because I’d think, “This is a show for people who like science-fiction, or readers who have some working knowledge of information technology.” But, my parents don’t even have cell phones and they enjoy it. I guess it’s reaching people on other levels. It’s a show about these interesting people who fight crime, even if crime is a malicious artificial super intelligence — it’s still the good guys and bad guys. They like the camaraderie and they like the dog and they like the funny stuff in it. And they like the Avengers part of it — kind of caped crusaders without capes. There’s a lot of way in which our show is a like a graphic novel. There’s very set looks to people, and there’s a very set way action takes place, and the way it’s cut. I get it. I get what they like. People really love [Bear,] the dog. ME: That’s it! That’s it. He was the missing ingredient of domesticity. These guys may be upset, suicidal vigilantes, but they have to bathe their dog. Finch and Reese start off as reluctant partners in many ways, but have evolved a lot over the years. What do you feel that relationship means to the show, and what does it mean to you? ME: I think it’s cool to have two lonely men with missions, who seem to have little to live for — and certainly no room for friendship in their lives — and yet, this desperate mission they join together on, it does humanize both of them. It becomes a reason to live and fight the fight. Family. Ultimately it supports the notion of family, no matter how exotic or non-nuclear. And if anyone has any last hesitations about watching the show, what do you want them to know? ME: I would just remind them, keep thinking about that Machine. There’s way more to that Machine than meets the eye when you first start watching the show. You’re going to go places with that Machine. Planning to watch POI on WGN America? Follow the PERSON OF INTEREST writers’ room account during the September 1st launch for tweets from the writers! Showrunners Jonathan Nolan and Greg Plageman will join after the debut at 7 PM PT/10 PM ET, with some additional behind-the-scenes tidbits.